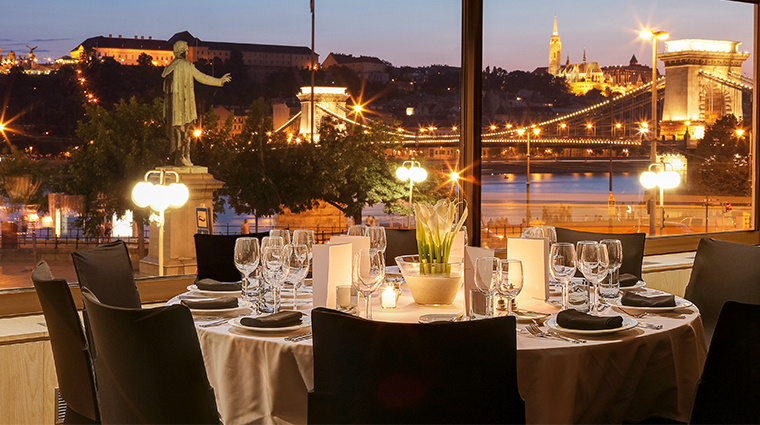 Situated next to the Chain Bridge overlooking the Danube with staggering views of the Grand Palace, the primo city-center location of Sofitel Budapest Chain Bridge might be its biggest selling point. Boasting a sophisticated and contemporary aesthetic (a large 18th-century model airplane hangs from the lobby ceiling and is illuminated by glowing red lights), the modern feel of the public areas and the rooms provide an interesting contrast to the city’s famous Roman, Gothic and Art Nouveau architecture. Stretched over eight stories, the atrium of the lobby is one of the most impressive spaces in the entire hotel. With parquet flooring, warm red and pink ambient lighting and a flamboyant Swarovski crystal fountain, it makes a dramatic impact. Nearly all of the Budapest hotel’s 357 rooms offer views of the city or the famous Chain Bridge. Vistas aside, even the smallest of the rooms offer generous marble bathrooms with a soaking tub. Despite its lack of an original name, the Paris Budapest Restaurant’s fare is innovative and interesting, a fusion of Hungarian classics and French technique. You’ll find dishes like Charolais beef cubes in a green pepper sauce or hearts of artichoke paired with lemon confit and parmesan foam. 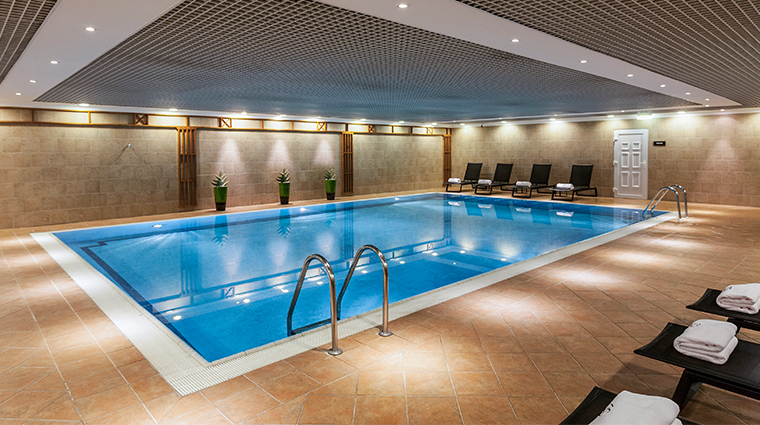 Small but serene, the spa is a refuge from the busy streets of Budapest — you can opt for a deep tissue massage or other treatments performed with exclusive Sothys products, or just relax in the heated pool and sauna. Framed by the Danube River and Budapest’s famous 18th-century Chain Bridge, the entrance of the boxy building makes you feel as if you’ve been transported to an entirely different century. Soaring ceilings, contemporary seating, a library door draped with a waterfall chandelier all contribute to the hotel’s decidedly modern feeling interiors. While the rooms have stellar views, marble bathrooms and décor that nods to the luxury hotel brand’s French origins, there is no art in the room and the walls remain white and stark. 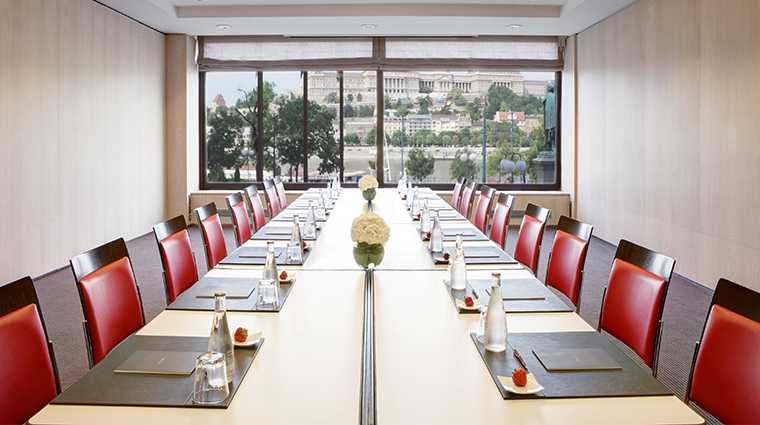 Sofitel Budapest is within walking distance to Vaci Street (the main pedestrian thoroughfare), the Castle District, the Hungarian State Opera and the Budapest’s famed café culture. Comfortable and intimate, the contemporary-classic rooms don’t look or feel cookie-cutter or impersonal. The rooms are also spacious — even the standard rooms feature plenty of living space with each one encompassing 300 square feet or more. The marble bathrooms and Hermès bath products are a highlight, but the pinnacle of every room is the panoramic view of the city, the Danube or the gilded parliament building from the floor-to-ceiling or bay windows. Like many of the other luxury hotels in Budapest, rooms on Sofitel’s club floor feature added amenities and complimentary extras like breakfast, daily snacks and drinks, VIP check-in and check-out and 24-hour butler service. With 220 extra square feet of space and an extra set of floor-to-ceiling windows, the Prestige Suites are a safe upgrade. The separate living room is cozy with desks facing the window and plenty of amenities for business and luxury travelers like club lounge access, free Wi-Fi, flat-panel TVs and coffee and tea. The lobby's spectacular atrium extends into Terrasse Restaurant, which serves breakfast and brunch. The bright pink chairs, tiled mirrors and the waterfall fountain in the background give the space an energizing boost of color and personality, making it easy to spend hours lingering over eggs Benedict and warm coffee. Paying homage to Budapest’s nickname “Paris of the East,” the Paris Budapest Restaurant blends the best of both in the seasonally rotating menu. You’ll find ordinary French and Hungarian basics, French fries with aioli and steak or steaming ghoulash soup, but you’ll also find more original dishes and a rather surprising and international wine list. 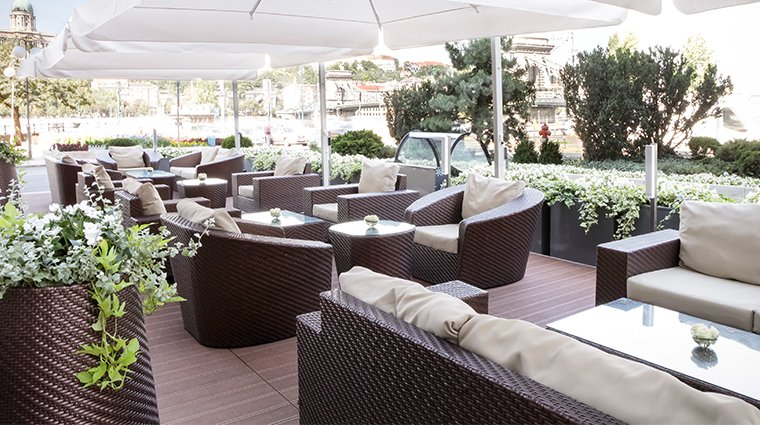 The terrace bar, which is packed with just as many locals as guests, serves up trendy cocktails; the Biblotek Lounge entertains with a live piano player, light bites and the chance to order from Paris Budapest’s rather impressive wine menu.